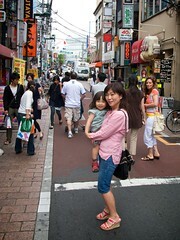 This post is a little late, but here are photos of our day in Jyugaoka. This is an annual event to celebrate the strong cultural relationship between France and Japan. We spent the day with our friends, Angelo, Sue, JK, and Kelly. Phoebe also had a good time with Alex, Jane, and little Emma. The Franco-Japanese relationship is very strong, some think it has a lot to do with Jacques Chirac’s love of Japan. He’s visited the country over 40 times and is considered an expert Japanophile! In addition to shared political aspirations, the two countries have historically shared ideas in art and cooking. Japanese cuisine is greatly influenced by French cooking styles. There are actually more restaurants with Michelin Guide stars in Tokyo than in Paris! This love of food and wine is very apparent in Tokyo. The French also love Japanese Anime, and likewise the Japanese have incorporated historical figures from France in many of their popular stories. Visit the Japan-France Relations website for more information on this wonderful cutural exchange.